For further details on the current course please contact the course administrator or click here for further information on the weekly topics. This is a non-credit bearing continuous professional development (CPD) course which aims to provide teaching staff the opportunity to develop and improve their understanding of, and practical skills in teaching, learning and assessment. 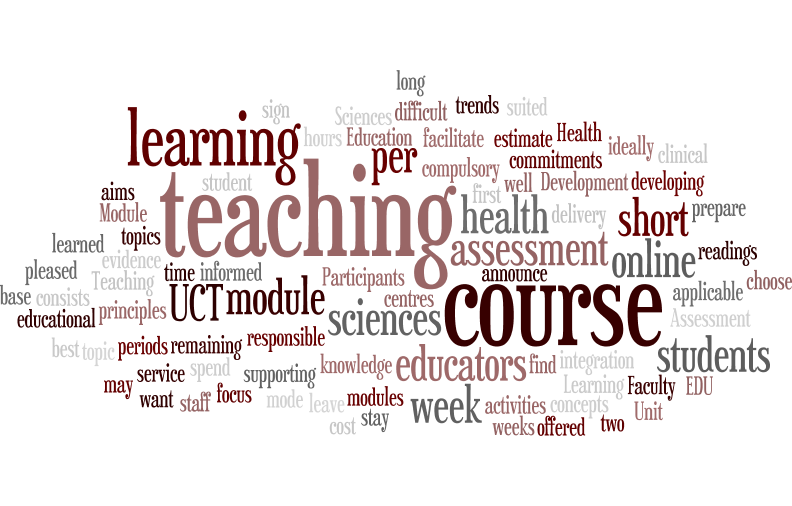 As of 2016 this is an accredited UCT short course for which you will receive a UCT certificate on completion. Module 1 focuses on best evidence teaching and learning. For more information click here. The next iteration of this course will be in 2018. Module 2 centres on assessment of student learning.The next iteration of this course will start on 23 July 2018. This CPD accredited course is designed for educators, clinicians and teaching professionals who would like to integrate e-learning technologies into their teaching strategies. It may also be of general value to those who are interested in learning more about some of the most commonly used technologies, or would like to implement them in their interaction with students but are not sure how to do so. This course is aimed at individuals who are not experienced users of e-learning technologies. The next iteration of the course will run in January 2017.